For those looking for diversity, diversion and rest for a short period of time, the Ecuadorian city of Cuenca has many advantages to offer as a tourism destination. 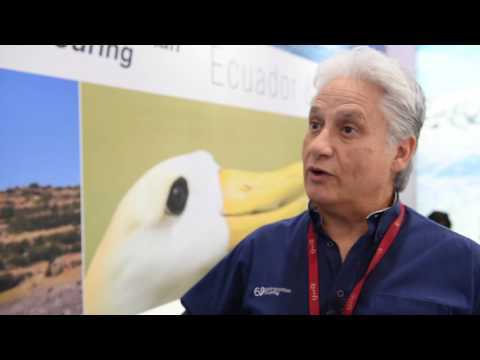 Francisco Dousdebes, Galapagos product manager, Metropolitan Touring speaks to Breaking Travel News at World Travel Market 2016. On the agenda are the ecological conditions of tourism in such a pristine natural environment, how the brand grew this year and what is on the agenda for 2017. Ecuador’s Mashpi Lodge has launched its highly anticipated Dragonfly canopy gondola. The new product is designed to allow guests to enjoy captivating bird’s eye views of the 1,300 hectare Mashpi Rainforest Reserve via a cable-driven system of gondolas that glide above, below and through the tree canopy. The experience takes guests up to 200 metres above the ground and travels two kilometres across the magical cloud forest with Mashpi’s resident naturalists to identify the sights and sounds of the forest. For the third year running, Mariscal Sucre International Airport has been recognised by the World Travel Awards as South America’s Leading Airport. At a gala ceremony at Swissôtel Lima in Perú, Andrew O’Brian, president, Corporación Quipor, accepted the trophy. Ministers and high representatives of UNWTO Members States in the Americas meeting in Havana, Cuba have express their full support to Ecuador following the tragic earthquake that struck the country’s central coast on April 16th, 2016. The statement came during the occasion 60th meeting of the UNWTO Commission for the Americas. Ecuador’s ministry of tourism has reported that the tourism infrastructure, services and attractions in the Amazon, Andes, Galapagos and parts of the coast are in excellent condition following a recent earthquake. Airports, hotels, restaurants, tour operators, ground transportation, parks and nature reserves are all fully operational and welcoming visitors, the ministry said in a statement. The new Mariscal Sucre International Airport in Quito has reached three years of operations and within a short period of time has managed to position itself among the leaders of the airport industry in Latin America and the Caribbean thanks to efficient management with a focus on customer service. The ministry of tourism of Ecuador has hosted the global launch of the second stage of its ‘All You Need Is Ecuador’ campaign. The event took place at London’s emblematic Tate Modern, with the presence of minister of tourism Sandra Naranjo and other government representatives from the country, as well as guests from the UK tourism industry, media, and Ecuadorian private sector. Ecuador’s Ministry of Tourism announces the kick-off of a 10-day road show aimed at educating tour operators, travel agents and media on the destination. Having just taken the title of South America’s Leading Destination at the World Travel Awards, Quito, capital of Ecuador, has been riding high. Here Breaking Travel News editor Chris O’Toole visits the city to see how it is coming to terms with its newfound place in the international tourism spotlight. Video: Ahead of the World Travel Awards South & Central America Gala Ceremony 2014 Breaking Travel News editor Chris O’Toole here sits down with newly appointed Ecuadorian tourism minister Sandra Naranjo to discuss the upcoming event. Minister Naranjo also discusses her ambitions for the office, the growing importance of the tourism sector to the Ecuadorian economy and the new markets the country is seeking to develop.